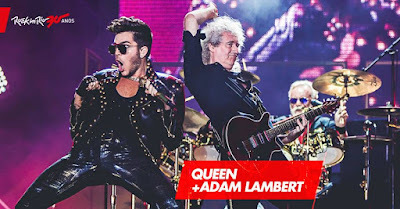 Queen and Adam Lambert headlined opening night of the 30th anniversary of the Rock In Rio festival in Brazil on September 18 and video from the event is available. Joining Queen on the event’s opening night bill were One Republic and The Script. Queen’s appearance marked the band’s return after opening the inaugural event in 1985 with original lead singer Freddie Mercury. The band’s opening night on January 11, 1985 at Rio’s custom built City of Rock exploded the record books, drawing an audience of over 250,000. The band’s second appearance on January 18 brought their total Rock in Rio audience beyond 500,000. Televised to over 60 countries across the world, Queen’s 1985 performance were watched by nearly 200 million people. Queen albums occupied all top ten places in the Brazilian album chart and “Love Of My Life” became a new Brazilian anthem. 0924-15 UPDATE: The original video of the full show has been removed from YouTube for copyright reasons. In its place, we have added a few individual songs from the concert that are currently available online.